The Rockets defeated the Mustangs 12-0 in five innings on April 23 at Hopkins. West Nodaway junior Parker Ogle slides safely back to first base while North Nodaway sophomore Ryan Riley awaits the throw. 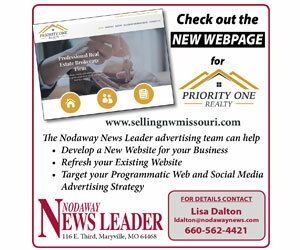 For more photos and information, see the printed Nodaway News Leader. “Finding Favour” will perform at 7 pm, Wednesday, May 2 at the Laura Street Baptist Church, 120 South Laura Street, Maryville. Concert is free and open to the public. Today’s Civic Women will meet and install officers at 6 pm, Tuesday, May 1 in the Maryville Public Library basement meeting room. Everyone is welcome. Taco bar luncheon fundraiser to benefit the New Nodaway Humane Society from 11 am to 1:30 pm, Thursday, May 3 at the First United Methodist Church, 102 North Main Street, Maryville. The free will donation lunch will feature taco salad, ground beef, dessert and beverage. Carry out is available.